The buzzword in stock market today is Microfinance entering Capital markets. SKS Microfinance is going to raise Rs. 163 Crore through its IPO which is in news for few weeks. The Hyderabad based institution will be priced at Rs. 985 per share and the shares were oversubscribed by 13.7 times. CRISIL reports that the company is today’s largest MFI in India in terms of total value of loans outstanding (Rs. 29,367.20 million), number of borrowers (6.78 million), and number of branches (2029 branches in 19 states). The microfinance concept in India took off after adapting ‘Social Collateral’ concept by Grameen Bank, Bangladesh. This includes lending to Joint liability group ( For e.g: if Rs. 10,000 is given to a group of 6 women, each woman has to make a monthly payment of Rs. 150/- if one fails, entire group defaults and interest rates are affected). This model ensured credit discipline through mutual support and peer pressure, focusing on income generating loans and lending exclusively to women (to reduce the chances of default). Microfinance institutions in India since then started growing. SKS Microfinance, Spandana Spoorthy, Share Microfinance, Asmitha, etc were few of them who are today’s market leaders. “you are promising your investors that there is a lot of money to be made and that is a wrong message because lending to poor is shown as an opportunity to make money”. Vikram Ahuja (Founder of SKS) reaffirms about the prospects of high and assured returns which will bring funding to the sector whose needs are gigantic. It is right that MFI still required capital to lend to these people but the answer do not lie in capital markets. The answer is Money market. Yes MFI should be given access to money market which will help them to get fund at cheaper rate. Following the Bangladesh model, RBI should institutionalize all the lenders. This will also help us to curb the parallel economy (Black money) building a better nation tomorrow. Finance Friday: Telecom Sector Back with a Louder Ring! I think that Microfinance, once it reaches a Capital Market, will defeat the goal of Microfinance itself. 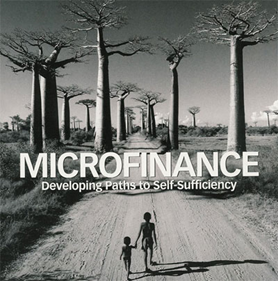 The goal of Microfinance is to help the poor and end poverty. If people are investing in it to get higher returns, it defeats the point. I believe that Microfinance should only be looked at through a non-profit view. I volunteer with a non-profit called United Prosperity and we guarantee loans to women in India. For every 1$ we guarantee, twice that amount is lent to women entrepreneurs. This model has been successful and is quite different than other MFIs out there. I hope you check us out! Micro-Finance to Face Slow Painful Death. SKS Share to enter Free Fall. Sell, Sell, Sell! SKS, the Indian micro-finance giant’s IPO was supposed to signal the coming of age of the micro-finance (MF). Instead, it contained the seed for the destruction of the entire industry. Their Rs 10 share on listing attracted a premium of Rs 975 and such was the investor confidence, it touched a high of Rs 1,490 in a matter of days. Then hell broke loose with the industry hit by charges of them profiteering and causing farmer suicides. Its reverberations were so strong that it had been felt by the industry all over the world. The stock plunged to Rs 890 before recovering to be a tad over its listing price and hovering around this range for the last one week. We expose the dark underbelly of a Frankenstein unleashed by NGOs. Dear Rishabh, could you please explain more about how multiple lending will create MF-bubbles in India. Now look at what is happening, single requirement is refinanced by multiple MFI (this is widely seen since sudden inundation of MFIs in India). In the end, this becomes a bubble. When the severity of this issue is high, the risk weight for this bubble increases. see, micro finance is a group activity based and if a member wont pay, then the whole group will be penalized before loan sanction, MFIs verifies all the documents including repayment ability and even they check the clearance. If a group required 5 lakh (1 lakh x 5 MF loan), they could go to any bank. why they will pay 24% interest. Again, as any default with the motive may cause serious action for the group as well as the group leader. So what I feel that, bubbles may not come. If possible please put forth your view. I am somehow not convinced that the linkage of capital market and micro finance will act as a panacea to the indian poverty. The flaw in approaching the capital markets is the requirements of the markets it self. The stakeholders are invested in a company coz they want to earn a return to over and above their investment. Now assuming that the SKS gives out loan at minimal rates of 5% p.a. which it passes on to the stakeholders. This is means the stock is underperforming compared to the benchmark Sensex which on a normal year would return a close to 10-13% p.a. So in due course of time, investors will realize this and will shift the funds. And this is definitely not beneficial to SKS Microfinance. The article is thought provinking…. I just realised that if this remains to be the success of MFI and money markets turn to be a boon …. could they together solve the BIGGER issue of Financial Inclusion in India ?? Interesting….Got a few new insights! On the other hand, their nature of operation is either social in nature or low-margin business, catering to the poor and needy people. This also reminds me of Oil marketing PSUs, which are burdened by huge fuel subsidies and yet listed on the bourses. Aren’t they serving a social cause by providing lower than market price fuels?? – yet investors have latched on to these under-performers on hope that these counters will gain once complete fuel price decontrol is implemented by the government. Another obvious question – if Govt wanted to control the fuel prices, why were OMCs prompted to be listed on the bourses, when their business-case remains purely dominated by government polcies and diktats ??? A typical dilemma that doctor faces – he cannnot ‘delightfully’ reply that my business is doing well; which is actually a pointer towards more and more people are getting ill and needs medication. Answer is money market as in it comes under purview of RBI (Regulator in : Money market like SEBI regulates capital market).